The popularity of "convenience voting" measures -- vote-by-mail (VBM), liberal absentee voting and Early Vote -- has grown in recent years. A majority of states now permit voting by mail upon request, early voting, or both. This trend towards convenience voting has been propelled by its popularity among voters and a perception among policymakers and advocates that such measures decrease costs, increase turnout, and are generally more advantageous than casting a ballot in person on the second Tuesday in November. While legislation introduced in 2008 by state lawmakers indicates that this trends continues, few states saw passage of significant laws that alter the traditional way America votes. Furthermore, research suggests convenience voting may do little to expand the electorate, let alone increase voter turnout. 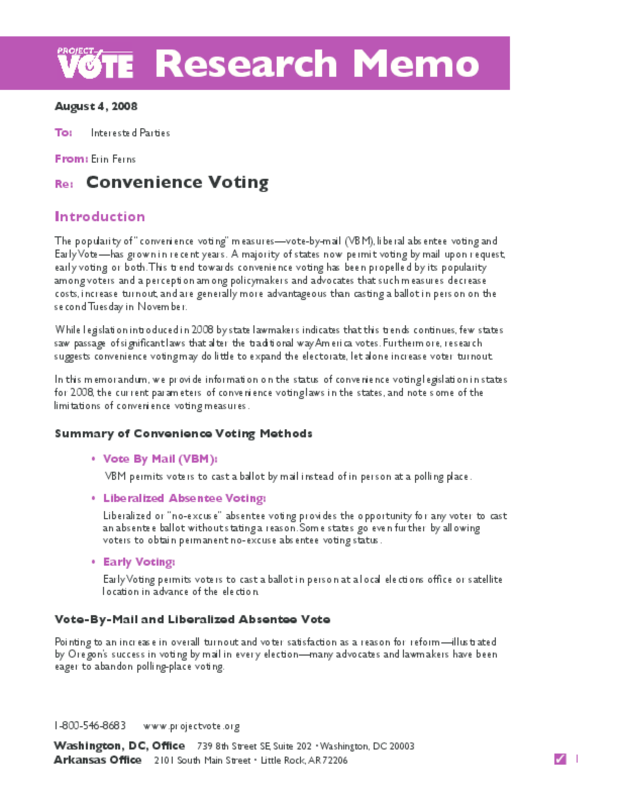 In this memorandum, we provide information on the status of convenience voting legislation in states for 2008, the current parameters of convenience voting laws in the states, and note some of the limitations of convenience voting measures. Copyright 2008 Project Vote. All rights reserved.